with removable pad for covering with tapestry or fabric of your choice. 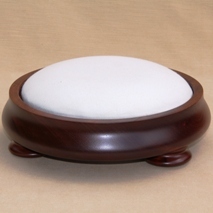 Shown here is good mahogany, also in natural or teak finish . all good colourings . depth of wood on sides is 2 inches plus bun feet . we can fit your tapestry on to the stool . or can have made to measure . Stretching and fitting costs about £30 but please ring for more detail as each one is usually different ! 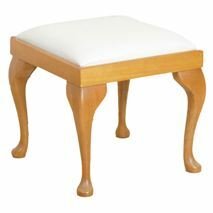 FUR001 9 " x 9" footstool with bun feet . 2 in stock . 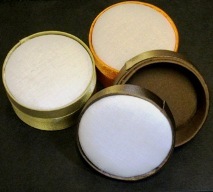 Available in 2 different sizes and a variety of finishes. Shown here in natural. 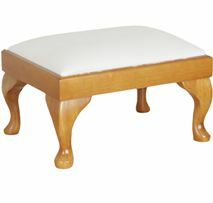 FUR004 12" x 16" rectangular footstool with Queen Anne legs . one mahogany in stock . Finished height off the ground is 9 inches . 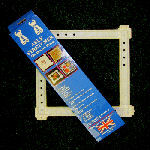 with removable pad 11 x 15 inches for covering with tapestry or fabric of your choice. Shown herei n natural also good mahogany or teak finish . all good colourings . 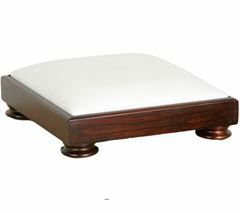 A good sturdy low level footstool . FUR006 15" x 20" wooden firescreen . 2 in stock in good mahogany colour . Inside of aperture measures 14.5 x 19.75 inches .